My Impressions: Simon Says Stamp March Card Kit & GIVEAWAY! 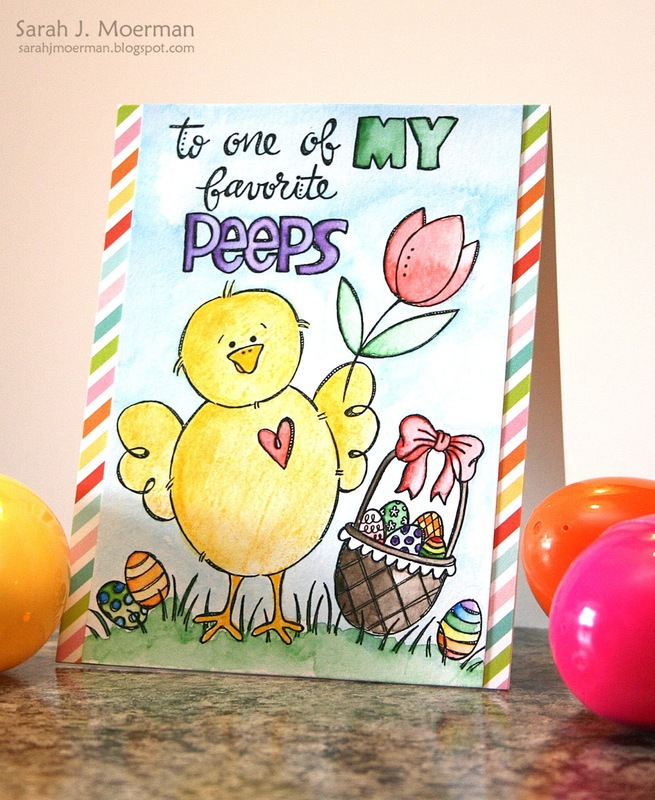 I'm popping by to share the latest Simon Says Stamp Card Kit: Favorite Peeps and a card I made with it. This month's kit is perfect for Easter and all things Spring! It includes two adorable Suzy Plantamura pictures printed on Distress Watercolor Cardstock for you to colour, a sweet Peeps-themed stamp set with matching dies, some fun Simon Says Stamp Sunshine Mix Sequins, cute Echo Park Spring 6x6 Papers, one random Bright Distress Crayon, and some fabulous Spring-coloured Simon Says Stamp Cardstock. I couldn't wait to try the new Distress Crayon that came in my kit (mine was Mustard Seed) and started colouring this sweet little chick right away. I discovered that if you want a more watercoloured look and better blending with the Distress Crayons it helps to wet your watercolour paper first. The neat thing about these crayons is that I was able to get a watercoloured look on the chick's body and use the the crayons straight for more intensity on her beak and legs. I used my Gansai Watercolors to paint the rest of this sweet image and once dried I trimmed down the sides, tucked some of the adorable Echo Park Spring 6x6 Paper behind it, and adhered it to a notecard made from Simon's Ivory Cardstock. This is just adorable....and seems quick to make. So cute! And great info on the crayon, I'm really curious about those! So cute! I love making cards and this kit seems like such an easy way to make some. Such a cute card and thanks for the info on the Distress Crayon. Love this stamp set and kit. I love my marshmellow peeps. This image would be adorable for my grandson's Easter card. I need to take the time to practice using watercolors. I like what you did with this card. Sarah - I always love your projects - and this one is just adorable. Love the kit! Cute and colorful card! Thanks for sharing! This kit is very fun. A crayon to test would be fun too! Such a cute card! your coloring is awesome. Have not tried the crayons yet but after seeing this card, they are at the top of my wish list. so cute! i can't wait to try out those distress crayons! this is such a cute chick. i would be excited about that new crayon also. Love...love...love your card.....and the set is wonderful! Absolutely adorable! This looks like a wonderful kit....and I'm excited to try the Distress Crayon too! This is so darling!! I love this sweet spring kit and will cross my fingers to be a winner! This is such a wonderful kit with so many great products! I love the way you colored! Your card is so cute. Love the papers in this kit. Thanks for sharing. Love the new card kit and the watercolor cards. So peeping cute! Looks like a fun card to make. Very cute! OH! That is SO cute! Excited to try the Distress Crayons. This card is darling and the March Kit looks amazing. Love the peep die cuts. This kit looks like so much fun and love the colouring pages it contains. So good to see someone use the new crayons, I wondered how they coloured and can see these are going to be so popular. Looks amazing!!! Such vibrant and pretty colors and your card is so delightful!! Great release and what an adorably cute card! I love this kit and your card is adorable. Such a cute card! Thanks for the chance to win this adorable card kit! Really adorable panel and love the rainbow peeking out from the sides. Because no matter what I ask of Google/Blogger over the last 3 years, doesn't look like they're ever going to release me from the dead blogger profile with closed email address for my blog moved to WP 2012! Such a fun looking card! Super cute card! Loving this card kit! Those peep stamps are TOO CUTE.